Three year old Alaska has been happily reunited with her owner after going missing from her home in Taunton for over 10 weeks. 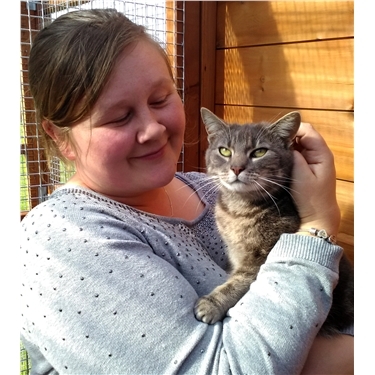 It was a somewhat tearful occasion when she was collected by her owner and the purring and chatting showed how delighted everyone was! She had been found in a garden some distance from her home and Cats Protection were called to scan her for a microchip. Unfortunately, although chipped, the registration of the owners details had failed to be recorded onto the national database due, it is believed, to an error with the database system. After extensive detective work, the vet practice who had originally implanted the chip was identified and from their records it was possible to find the details of her owner, who in fact had reported her missing to the vet when first lost. Fortunately the owner had a copy of the microchip number with Alaska's vaccination records and thus it was possible to prove without doubt that she was their missing cat. The database records will now be registered properly and this story highlights the importance of ensuring any pet microchip details are kept fully up to date. Owners move home, change their phone numbers, or sometimes rehome their pet with a new owner and the recorded details are not updated. When this happens, it is sometimes impossible to trace a found pet's owner and a huge amount of time can be spent by welfare organisations and vet practices, trying to find the owner of the animal. This story shows that it may well be worth just checking that your details are correctly registered by logging on to your record or by calling the database company to check that all is well. If your cat is chipped and goes missing, please call the database, all vets in your home area, Cats Protection and other animal welfare organisations and in the worse case scenario, the local Borough Cleansing Department. Responsible owners do always want full closure if they lose their pet. If you find a friendly cat, remember that it will belong to someone and therefore please report it, and if possible take it to a vet to be scanned for a microchip - this will be done for free and could mean that a reunion just like Alaska's, will mean a happy ending for the cat and their owner.